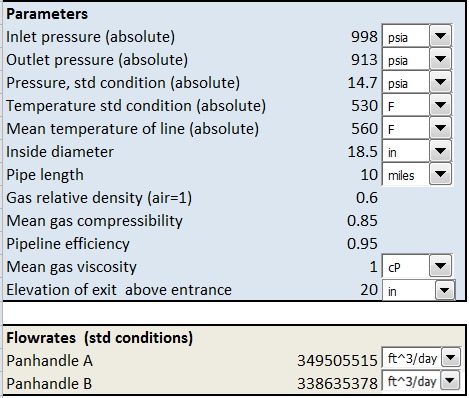 This Excel spreadsheet calculates the Panhandle A and B equations for the flow of natural gas through high pressure pipelines. You can choose between USCS (field units) or SI units, and even mix both (the spreadsheet does the unit conversion for you). With Excel's Goal Seek function, you can also back-solve. For example, you can ask Excel to calculate the exit pressure that gives you a desired flowrate. Weymouth (1912) developed the general gas flow equation. However, a limitation is that the friction factor can only be obtained iteratively. Hence simpler relationships based on the gas flow equation were developed, including the Weymouth equation and the Panhandle A (developed in the 1940s) and B (developed in 1956) equations. These correlations simply substituted equations for the transmission factor (i.e. the friction factor) into the general gas flow equation. The Panhandle equations are considered fairly accurate for Reynolds numbers between 4 million and 40 million. Panhandle A is best suited for 12-60 inch diameter pipelines at pressures between 800 psia to 1500 psia. Panhandle B is most often used for pipes with a diameter of 36 inches or larger, and pressures above 1000 psia. Gas flows in pipelines with diameters of 15 inches or below are better modeled by the Weymouth equation. These are the equations implemented in the spreadsheet. The notation is defined in a prior blog post that explores the Weymouth equation. There is a fundamental error in the pressure conversion. The metric to imperial conversion factor should be the inverse of that stated in the spreadsheet!